Congratulations to Mary Bryson and Adrian Starnes, winners of the December Photo of the Month Contest. This was the final contest for the semester and both students will receive a free dinner at Quattro Passi pizzeria. Mary Bryson was able to capture a calm moment as the sun set over Spoleto, a nearby hilltown in Umbria. 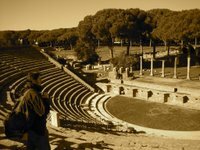 Adrian Starnes caught Professor Giampiero Bevagna in a reflective moment while on a class trip to Ostia Antica. Complimenti a Mary e Adrian!